Ok, thank you for the reply. I'll contact one distributor in my Country. I'm trying to create an account at the Digilent store for purchasing a PYNQ-Z1 board, but I had a problem in the middle of the process. I live in Brazil, but as far as I could see at the country box in the shipping details, the Digilent store doesn't ship to Brazil. Is that right? If I'm incorrect, what do I do to work around this problem? 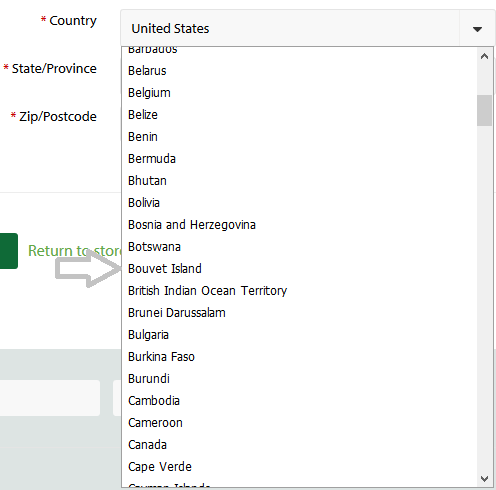 * In the attached image, I show the Country box in shipping details. The 'Brazil' should be beneath 'Bouvet Island'.